Can the growing global threat be stopped? After centuries of inactivity, piracy has returned with a vengeance. Maritime marauders now operate across the globe from Peru to the Philippines, but they pose the biggest threat off the coast of Somalia — a failed state in the Horn of Africa. 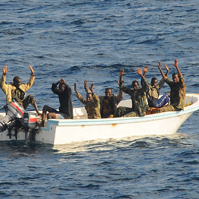 In the first six months of 2009, attacks by Somali pirates jumped sixfold over the same period last year. Piracy costs global shippers $10 billion to $50 billion a year in ransoms, lost cargoes, higher insurance premiums and disrupted shipping schedules — costs that are passed on to consumers. The world's largest navies have sent warships to the Horn of Africa in recent months and have captured more than 100 pirates. But it may be too costly to maintain the naval patrols over the long term. In addition, murky anti-piracy laws and jurisdictional issues are hampering prosecutions. Moreover, some security experts fear pirates may be exposing vulnerabilities that terrorists could exploit to disrupt global trade, raising the stakes in the fight to solve a growing international problem.